At the recommendation of EHA USA president, Dr. Howard Searle, EHA USA executive director Robb Hansen recently read a fascinating book detailing the birth of India as a nation. Those of you in our e-news audience who enjoy books, particularly history, might find this interesting. It's not a new book; it first came out in the 1970s. But the information provides a great background on an important time in India's history. After some three hundred years of British control, India emerged as an independent nation in August of 1947. One need look no further than the ubiquitous presence of the English language among India's educated classes to understand the pervasive legacy of Britain on the sub-continent. The details of India's birth as a free nation--and that of Pakistan simultaneously-- are little known to those outside the country in our day. Yet anyone seeking a deeper understanding of the roiling dynamics which mark the India of the 21st century would do well to absorb the story of her birth. Freedom at Midnight recounts this story in satisfyingly accessible detail. 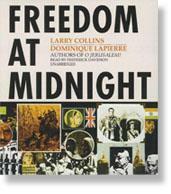 Published in 1975, the book by Larry Collins and Dominique Lapierre frames the move from British colony to independent nation in terms understandable to the western reader. Opening with the appointment of Lord Louis Mountbatten (cousin to then King George VI) as the last Viceroy of India, the narrative tightly retells the critical events which brought about independence, gave birth to Pakistan, and led to the eventual assassination of Ghandi. Names from history come to life and individual roles are told in a fascinating story that moves along at an attractive pace (it did for me, at least). Alongside Ghandi, we gain human sketches of Nehru, Patel, and Jinnah, each of whom played separately critical parts in this drama. Their contributions are told in grippingly human terms. Lord Mountbatten is painted sympathetically and perhaps somewhat heroically. This is not surprising as he and his personal papers were a significant source of information for the authors. Some parts of this story are not for the squeamish. The authors do not hesitate to recount, sometimes in lurid detail, the atrocities committed by Hindus and Muslims on one another. Hundreds of thousands of refugees fled their homes and villages as the nations of Pakistan and India were formed and citizens caught on the wrong side of ethno-religious borders sought sanctuary in safer areas. I encourage anyone interested in understanding the cultural and religious tableau of India to settle in and read this book. EHA USA executive director Robb Hansen had the opportunity to travel to India and visit several EHA locations last summer. This month he continues his series of articles, sharing his first-hand impressions of EHA's work and life in India. My feet slid on the muddy ground as I neared the tired red brick school building adjoining the hospital grounds. I was at EHA's medical facility in Chinchpada, western Maharashtra, and I'd been asked to speak to the students attending the affiliated school. They wanted me to share something from the Bible that might be meaningful to kids. We were supposed to meet outside under the big tree where everyone played for recess, but the rain was making that option unattractive. As we entered the building, we stepped through a small ante-room and into the main classroom of the spartan, four-room structure. Even in the daytime it was dark inside because of the overcast gray sky. The electricity was off at the time so there was no light (a common occurrence). Nearly 100 students greeted me as I entered the room, rising to their feet with the commotion one would expect from that many kids, aged 6 to 14, anywhere in the world. I asked my translator if the students would sit down on the benches. He smiled at me as if I were a bit daft and quietly said, "No, they will stand out of respect." That was that. Everybody stands. As I greeted the students, letting my translator put my words into Hindi line by line, I got my guitar out. Energetically I sang a couple of fun songs, the sort we used to sing at summer camp. After that I launched into a short devotional message about the importance of building a good foundation in life, the importance of "building on the rock." I explained that the rock was God and no matter how hard the rain comes down, no matter how much the winds blow, no matter how much the floods rise, the house built on the rock will stand. After I finished, all the students clapped and cheered. It was a joy to see their smiling faces and to feel as though I'd made some contribution to encourage them, brighten their day, and steer them toward the Truth. As I trudged through the dripping water back to my lodging, I reflected on the importance of education and how these students had the prospect of a better life because of the EHA-backed school. I also reflected on how important it was for them to have better facilities and better materials. More teachers would probably also help. What was offered wasn't bad--it was much better than some of the local alternatives--but there is no doubt the education was rudimentary. The instruction in the school was part in Hindi and part in English, the latter being seen as an important tool on the pathway toward prosperity and success. 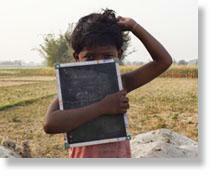 Please pray for EHA and their education initiative. Developing quality schools alongside the hospitals furthers the effectiveness of the organization's reach into the community. In addition, it helps doctors and nurses stay longer in their assignments at EHA locations. One of the crying needs for staff retention in the remote locations is access to adequate education for the children of staff. If you'd like to learn more about EHA's education work, please feel free to contact us at info@ehausa.org. We can provide a fuller picture of the goals and objectives of the effort and how you can get involved, either helping to fund the project or even how to get involved as a teacher or educational consultant. Quietly I slipped into the back of the room because the session had already started. I was visiting the Anugrah Project, headquartered at Herbertpur Christian Hospital in rural North India. On a low platform at the front, an energetic EHA staffer was going over basic courtesies in life with a group of developmentally disabled children and young adults. She was using a colorful flip chart and the group of 15 or so were learning how to say "Hello and Goodbye, Please and Thank you" -- that sort of thing. "Anugrah" means "grace," and we've featured the project for you before. What a joy it was to see up close the loving care being extended to these young people who would otherwise be complete social outcasts. Among the poor, especially in light of a Hindu worldview, those who suffer from any sort of disability in India have little hope of care, concern, or education. EHA is working hard to change that. Believing that every person has value and worth in God's eyes, those who work with the disabled seek to love them as God would, helping them to learn basic skills which will allow them to function in society and perhaps even find simple employment. Housed in a two-story facility at Herbertpur, Anugrah is expanding little by little. In addition to the services offered on the grounds, staffers have fanned out more widely into the surrounding district to identify additional individuals who could benefit from the program. The government-run schools in the area are in theory responsible to serve all children, even those with disabilities. Unfortunately, overflowing class sizes, lack of facilities, and inadequate training means most of these students get neglected, left at home, and are basically forgotten. The Anugrah staff provide parents and extended family members with training and guidance at the village level, allowing these who are among the most overlooked a chance to live more fulfilling lives. More broadly, EHA is leading efforts designed to proactively meet the needs of those who are disabled in India through training, seminars, and conferences. Last year our staff cooperatively sponsored "Engage Disability," a national convention designed to bring together many who share concerns for the disabled in India. If you would like to learn more about the Anugrah Project, please feel free to contact us and I'll put you in touch with the dynamic and caring team in India who is making it happen. They like nothing better than to know that others are with them. Their worthwhile efforts need your prayers, your encouragement, and your financial support. If you'd like to contribute to their needs, note the gift is for the "Disability Ministry" fund if you send a check, or select that option when you give online and jot us a note in the proper field as you fill out the form. EHA USA representative Robb Hansen had the opportunity to travel in the US in October with EHA Executive Director Dr. Sunil Gokavi. This month he continues his series of articles, sharing some facts about EHA and what we do. As I travel around talking with people about the great work the Emmanuel Hospital Association is doing, I find that there is sometimes misunderstanding about how the whole organization "works." Let me explain a few facts about EHA and what we do. These are not in any special order but are sort of offered as a mini-education on how we do what we do. Fact 1 - Almost every person working with EHA is from India. Out of nearly 2,500 employees, there are almost no non-Indians working in the organization. Occasionally, as one travels from place to place, one will meet various assorted "expatriate" missionaries: a couple from the US, a few people from Australia, here and there someone from the UK, and so on. But the vast majority of the workers are Indians. This is truly exciting because it means that a group of committed Indian Christians is taking responsibility and stepping up to provide quality medical care and show God's love to their fellow Indians. Fact 2 - For many of those working with EHA, serving in the northern part of the country is a cross-cultural experience within their own nation. This can be hard for those of us who are not Indian to get our minds around. We think, "Well, they are Indians working in India with Indians, so they must be fairly comfortable doing it." To some degree, this is true. But stop and consider for a moment: if you or I were to give up our normal job and travel say, to an Indian reservation in the southwest area of the United States, we might well describe what we were doing as a "cross cultural" ministry. The same applies for those traveling from the south to the north in India, especially when they have to learn a new language. Many of EHA's personnel find their work very challenging, serving in difficult and remote places. Fact 3 - For the most part, EHA is self-sustaining in its running costs, but can use our support in efforts to strengthen its infrastructure. Long ago, EHA discovered that it was best that they charge something for their services. As I heard Dr. Sunil Gokavi, EHA's executive director, say last week, "People value what they pay for." Therefore almost every patient is asked to pay something for their care (the charges can be as little as one dollar, which is hard for many to afford). The place those of us who are interested in EHA can help is with things like special equipment and the rebuilding of the hospital structures. In addition, support for overall administrative leadership costs (helping with travel and training) is a significant need. The way I like to think of it is that every dollar we can raise to support EHA - in any way - is a dollar that can be reapplied elsewhere in their dynamic efforts to serve the poor. Fact 4 - India is changing. As India strengthens economically, every citizen will surely benefit. But at the same time, more than 350 million people (that's more than the entire US population!) still live on less than $2 per day. Because of this, the need for EHA's services, particularly because they serve among those who are poorer in society, is greater than ever. In talking with people, I sometimes encounter those who wonder if the work of a group like EHA is even necessary any more. I can assure all of our readers that it is. While some government services are available, in most of the places where EHA locations are found, they are the only viable medical service provider of any level of quality at all. While not comprehensive, I hope that some of these insights shed light on how EHA functions and the realities they face. If you would like to learn more, spend some time on this website or give us a call at 1-888-893-2654. Thanks as always for your prayer and financial support! Dr. Vijay Anand Ismavel and his wife, Ann, have been chosen to receive the Paul Harrison Award for 2016 by the Christian Medical College in Vellore. This award is given to alumni of CMC "for a lifetime of selfless, steadfast, and significant service in needy areas, in mission service, or in disadvantaged and under-recognized circumstances." This award is also a reflection of the excellent work done at EHA's Makunda Christian Hospital. I huffed and puffed my way up the mountain path toward one of the villages that EHA’s Community Health and Development team from Landour Christian Hospital was working with near the far north Indian city of Mussoorie. This is rugged, beautiful country on the edge of the Himalayas that in many ways must be experienced to be believed. The real giants of this famous mountain region, K2, Everest and the like, are still further north. Here in North India one stands on the southern edge of the region, but the terrain is still impressive. Our driver on this sunny afternoon was Godwin, a young man in his late 20s, absolutely passionate about showing godly concern for the villagers in this remote region. The countryside is dotted with villages up, down, and across the valley. The scene might be reminiscent of a rural Appalachian landscape painting except the slopes are almost indescribably steep. To think that people actually lived, went to school, married, and worked in such a place was almost stunning to me. The families in these villages have been here for centuries, and for all that time they have crafted and cultivated a livelihood from farming on these impossibly steep slopes. Year by year, decade after decade, these hardy people have terraced the mountainsides in an effort to provide flat ground on which crops can be grown. Gazing around at the valley gives the impression of looking out on a vast tiered stadium of green. From a distance, one imagines the possibility of walking up and down these terraces like stairs. Up close, the “steps” are six to ten feet high and from 30 to 50 feet wide. On these meandering flat terraces the villagers grow beans, corns, and other crops which are sent to market in the south. When the weather is fine, all goes well. Unfortunately, during rainy season problems can arise. These slopes are so steep that as the rains race down the mountainside and begin to form rushing chutes of water, they begin to undermine the stability of the soil. This in turn results in landslides which vary from moderate to severe depending upon their size. The slides are life-threatening and always destroy years of hard labor. The terraces are ruined and, of course, the crops are washed away. Just one such slide can devastate an entire village and tip most of the residents, already poor, into poverty. EHA’s Community Development teams work with such villagers to improve the strategies and approaches used in working the land. The goal is to reduce the damage from the inevitable landslides and turn natural processes to advantage. The weather in this region swings from rainy to extremely dry through the year. Streams and rivers roaring with water for several months might be nothing more than dry, rock-strewn riverbeds a few weeks later, with nothing more than the tiniest rivulets of water flowing. Through the building of check dams with the assistance of EHA’s staff, villagers have learned to capture the rushing waters during the rainy season so that it is available for irrigation during the dry season. This simple strategy (though challenging because building a retention pond in this terrain is not easy) helps multiply crops and reduces the destructive flow of water. Through consistent efforts of kindness towards entire communities, EHA staff build bridges which lead to opportunities for expanded development assistance. All of this help is geared to communicate a sense of God’s love to these villagers and help them understand how to better manage daily life. For those interested, opportunities exist to volunteer with the Community Health and Development teams, whether as a student or during a sabbatical from work. Such experiences provide fresh insights into the needs of the poor and how they can be helped. Contact us today to learn more about how you can work side-by-side on an EHA project. EHA USA Executive Director Robb Hansen had the opportunity to travel to India and visit several EHA locations in July. In the coming months, in a series of articles, he will share his first-hand impressions of EHA's work. As my eyes drift across the green fields of crops that line the country road, I almost feel I could be in rural Iowa. Instead, I am in Maharashtra, a state in west central India, about two hours from the Arabian Sea. The fields are a mix of sugar cane, beans, and some corn. Rather than a big John Deere tractor, the farming implement of choice is pulled by a bullock. Much of the work is being done by hand and the farm-to-market process involves a stream of women bearing piled loads atop their heads. The jeep slows and we turn off the narrow paved road onto a dirt track. My head rocks from side to side as we bounce along what is best described as a wide foot path. Riding with me are Ashita and Danny, a doctor and a community health worker from Chinchpada Christian Hospital. This is the second stop on an afternoon round of calls into the community to visit palliative care patients in their homes. The rain has stopped and the sun has come out. Soon we abandon the vehicle. It cannot take us where we need to go, and we continue on foot. 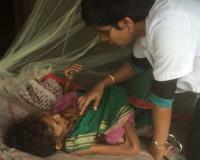 In India, particularly among the poor, medical care to alleviate the suffering of dying patients is relatively rare. Scarce family resources hardly seem well-used when spent on someone who will soon die no matter what is done. There are mouths to feed. Education to pay for. Tools to buy. Still EHA manages an expanding effort at eight of its locations to alleviate suffering and demonstrate compassion for terminally ill patients who otherwise would be more or less left to die in pain and silence. This care underscores the values that drive EHA which reflect the worth of every individual. On this stop Dr. Ashita, a gifted internal medicine doctor, gently examines her elderly patient. The woman lies on a rope bed on the "front porch" of the family's simple hut adjacent to their fields. A thin mattress beneath her provides some comfort, and was a gift from the community health team wanting to show Christian love to the woman and ease her last days. She is protected from the relentless assault of insects by a suspended mesh netting. It is oppressively hot and humid now. Sweat runs down the back of my neck as I watch the tender care EHA's team provides for this family. After quickly retrieving a second bed from inside the hut for me to sit on, the woman's husband stands nearby watching over her, quietly listening to the instructions of the doctor. There is very little that can be done. Now the woman is complaining of the tension in her abdomen and requests that the team drain the fluid from her to reduce the pressure. Unsure if it is necessary, the doctor decides that it is a simple enough step to take to demonstrate the reality that the team cares for the woman. Using a syringe and a bottle, the woman's belly is drained of the infected fluid that permeates her body. When the procedure is done, the doctor instructs the family (others have drifted nearby since our arrival) on how to administer the medicine that will provide relief in the coming days. Later Ashita told me that she only expected the woman to live another ten days. As we walk away from the dwelling, I am struck by the vast need here in India. In spite of the sophisticated government plans for medical care to reach into every corner of the country, the system all too often breaks down. The work of EHA is absolutely critical in places like Chinchpada where our hospital is the most sophisticated medical treatment facility for miles in every direction. Quite literally there would be no resources available to families like the one we have just visited if EHA was not here. And through innovative programs such as the palliative care effort that combines education and compassion, EHA is reaching out into the community. Each home visit in the palliative care program costs EHA approximately $5.00 including personnel, the vehicle, medicine, and other miscellaneous expenses. If you are moved to give to support the palliative care program for terminally ill patients, we would be grateful for your partnership. Your ongoing gift of $50 per month would fund 10 home visits. Thank you for your interest and help! Nothing so inspires and informs as face-to-face connection for our EHA USA team members with colleagues in India. That is why the USA Executive Director will travel to India this month, from July 8 to 24. On the trip he will have the opportunity to visit several hospital locations and attend the annual conference which assembles the entire leadership team from all locations across North India. Stops on the trip will include Herbertpur Christian Hospital, Landour Community Hospital, and Chinchpada Christian Hospital. "I look forward to interacting face to face on the ground at the hospitals, and rubbing shoulders with senior leaders," Mr. Hansen commented. "I hope those interested will follow our Facebook account to receive regular updates on our experiences." Congratulations to EHA USA President Dr. Howard Searle, who was honored with the 2016 INMED Cross-Cultural Leadership Award! Dr. Searle served in medical missions in India from 1965 to 1977. He helped establish and direct the Emmanuel Hospital Association (EHA), eventually transitioning the orgranization to Indian leadership. Since 1996 he has been the volunteer executive director and then the president of EHA USA, supporting the Emmanuel Hospital Association in India. He remains committed to the ministries of indigenous medical missionaries as they seek more effective ways to care for the underserved in rural North India. EHA USA President Dr. Howard Searle recently represented EHA at the 2016 INMED (Institute for International Medicine) "Exploring Medical Missions Conference" (EMMC) in Kansas City. "The Evidence Behind Medical Missions" was this year's theme. Medical missions has a rich history of compassionate risk-takers who have sought to serve the most forgotten people of our world. The 2016 conference sought to continue this work by equipping compassionate individuals with the skills and knowledge they need to address the needs of the world's most vulnerable peoples. Session topics included maternal/newborn care, community development, disease mitigation, and global health education. EHA's Dr. Savita Duomai was interviewed on the Worldview program on Chicago's WBEZ on February 24, 2016. She shared the work and vision of the Shalom Project in Delhi, which works among the poor and marginalized populations to care for people living with HIV/AIDS and those with other life-limiting illnesses such as cancer. You can learn more about the Shalom Project by downloading the PDF from the website. Just click on the link. Read the full summary of Dr. Savita's interview here. In the Wheels for the World program, run by Joni and Friends (JAF), wheelchairs are made available in different parts of the world, and a team of volunteers travels to assess, modify, and fit wheelchairs for people with disabilities. In October, 2015, the first Wheels for the World program in India took place. JAF worked with their Indian partner, Operation Equip India, the Community Health Global Network (Uttarakhand chapter), as well as the Engage Disability team including EHA members. EHA's Herbertpur Christian Hospital was chosen as the venue because it was near Dehradun, a state capital in North India, was central to access, and had the appropriate facilities. Overall, 210 wheelchairs, 46 sets of crutches, 42 walkers, and 32 canes were distributed. To read the full article about this wheelchair distribution by Anneliese Petersen, a Wheaton College biology student and HNGR intern at EHA's Landour Community Hospital, click here. Nepal has suffered yet another severe earthquake, this one having a magnitude of 7.3 and an epicenter 47 miles east of Kathmandu in a rural area. At least 65 Nepali people have died as well as 17 Indians in Bihar and Uttar Pradesh. Over 1,900 have been injured as many more buildings collapsed. Those near the first earthquake site have been hesitant to enter their homes and other buildings, fearing that earthquake damage would cause them to fall during an aftershock. This problem was only intensified after this new earthquake. Since almost 300,000 homes were destroyed and another 234,000 damaged in the first quake, many people are living outside with little shelter or food in cold temperatures with monsoon season right around the corner. The death toll of the April 25 quake has risen to 7,900 and the number of injured is over 16,000. 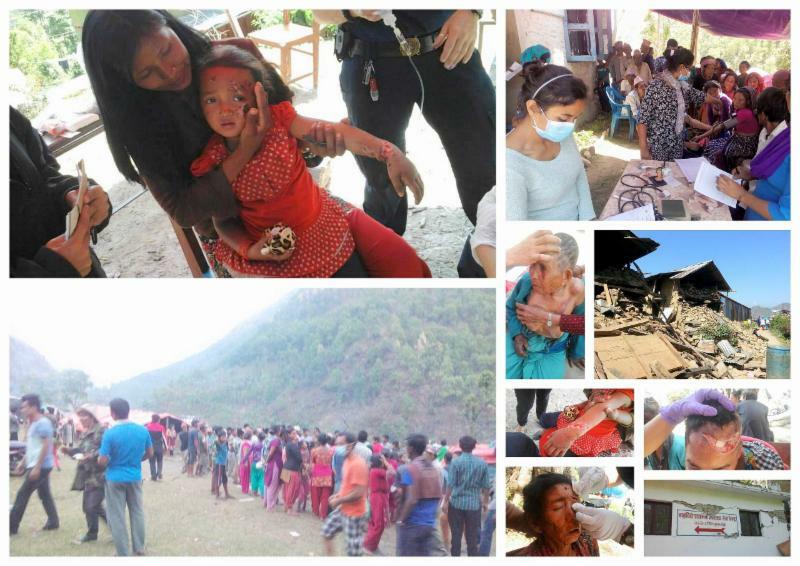 About 8 million of the 28 million people living in Nepal have been affected by this earthquake. Emergency medical care needs are declining, but there are at least 2 million people who will need tents, water, food, and medicine over the next 3 months. 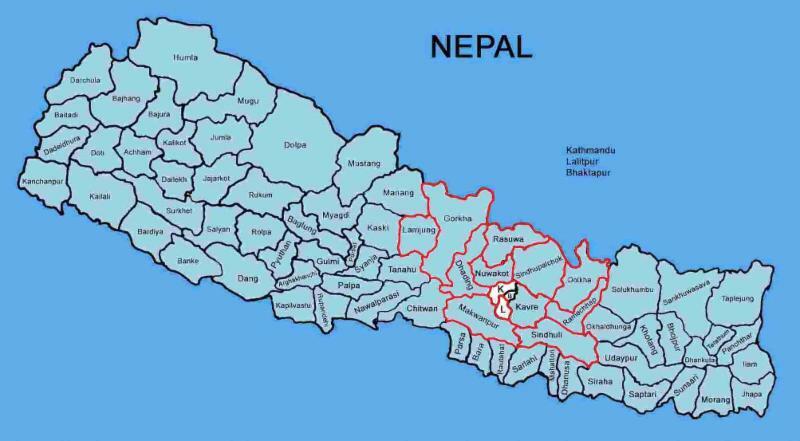 EHA is planning a 6-month relief effort to meet the long-term needs as well as the short-term ones in Nepal. We have years of experience working in natural disaster situations and we know how to help with all of the recovery issues that come up once the immediate medical needs are cared for. Our budget for all of these areas of care is $325,000. If you would like to give to help EHA relief efforts, click the button below. EHA's first medical team reached Nepal on April 27 with the twin objectives of assessing the needs and exploring partnerships with local organizations to provide the best medical response possible. Since then, EHA has mobilized 15-member teams to go in and set up medical camps that served about 100 villages in ten different districts. Over 2,000 people have benefited from these camps. EHA along with its partners is now looking at the possibility of having Satellite Rural Clinics with medical teams positioned at central locations in highly affected districts. The needs for food, shelter, and clean water are staggering. EHA has distributed 30,000 water purifying tablets, which is particularly important because of the likelihood of waterborne diseases after a disaster. We have sent in 250 packets of food and basic hygiene kits for villages affected in the Dhading district. We are targeting another 750 more packets for villages in the Sindhupalchowk district. EHA has begun distributing tarpaulins for temporary shelter with the goal of procuring 5,000 for numerous villages. They have also purchased 2,000 tents which are being prioritized for families with leprosy. Another area EHA is working to help is in psychosocial care for those traumatized by the earthquakes and aftershocks. We are training 40 to 50 leaders who will form at least 10 groups, and train 10 to 15 local volunteers each as care providers across target districts. These follow-up programs should serve at least 500 earthquake victims. Over 4,300 schools have been damaged in 41 affected districts, including 12,483 classrooms. This means 950,000 children will not be able to return to school until the government provides temporary learning spaces. EHA plans to work with partners to start play centers for the children in relief shelters, organizing fun materials for children including drawing and painting kits, toys, game kits, and snacks. EHA will be in these relief efforts for the long haul. We are in a unique position to cross the Nepali border and reach out with the love of Christ, both with our medical expertise and our disaster management experience. EHA has a well prepared Disaster Management Team, so they immediately sent in two vehicles to two different destinations in Nepal last week. They are distributing supplies, giving medical care, and assessing the needs. Three volunteer doctors are being sent to help the team at Anandaban Hospital at their request. Two other doctors and another staff member are working with partners setting up a medical camp supported from Duncan Hospital that will reach out to many villages in the Dhading area. Camp staff will identify patients who may be able to make the journey southward to Duncan Hospital in Raxaul, Bihar, North India, if adequate treatment is unavailable locally. A number of quake victims have already arrived at Duncan for treatment. 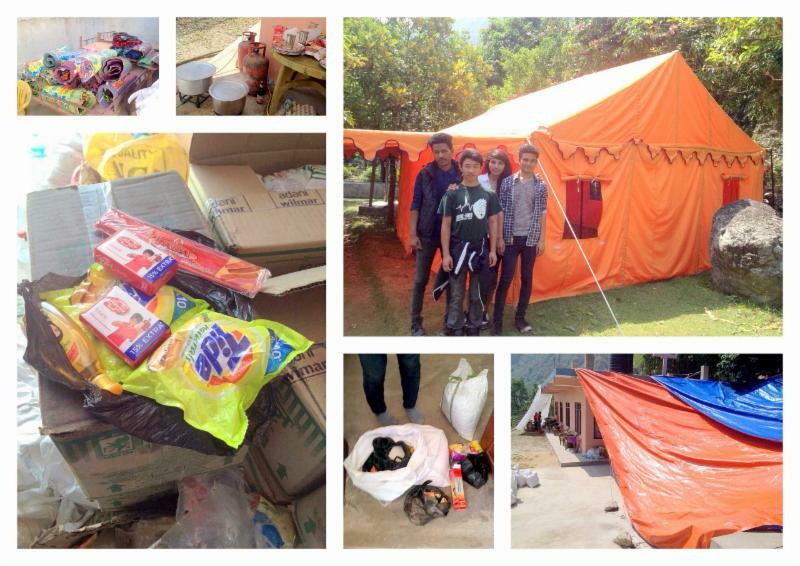 Supplies are essential, and EHA is sending in tents, tarps, dry food, and blankets in the coming week. Volvo is donating the use of two buses to transport in supplies and bring back patients. Staff at Duncan are working with the recommendations of those in Nepal to purchase the needed medical supplies to send in to the camp where survivors are located. EHA is also formulating a plan for psychosocial support by training volunteers who will be able to go in and help. They are also planning for a medium-term (six to nine month) intervention for rehabilitation. A group of Nepali doctors and representatives from Christian churches have formed the Disaster Response Christian Committee (DRCC) to coordinate relief activities in Kathmandu and other nearby disaster-hit areas of Nepal. The DRCC is working with the Nepal Christian Relief Services, which is formally registered with the government of Nepal. EHA is communicating with DRCC's contact to determine the best ways to help. EHA is building a database of Indian volunteers who can go to Nepal to help according to qualification, availability, and duration. Should you have the flexibility in your schedule and the proper skills, and if you sense the Lord directing you to go to India/Nepal to assist EHA's efforts, please contact us. Only those with emergency medical skills are needed at this time. EHA is also working with Engineering Ministries International (EMI), a Christian organization that mobilizes teams of civil engineers to help with water and sanitation, and teams of structural engineers to assess and develop repair details for damaged buildings. Patients are already arriving at EHA's facility in Raxaul, Bihar on the Nepali border. EHA dispatched a disaster response team to Nepal from Delhi on Monday morning, April 27, local time (Sunday evening in the U.S.). Your immediate prayer and financial support to undergird EHA's rapid response will be appreciated. As is clear from the media, the situation in Nepal is serious and will likely require significant resources to adequately respond to immediate and long-term needs. Current efforts are focused on emergency medical care, shelter, food, and clean water. Longer term needs will be assessed as the situation unfolds. To this point, more than 4,600 people have died and another 9,000 are injured. Over 8 million have been affected across Nepal. EHA's Duncan Hospital in Raxaul, Bihar, is located only 200 km (125 miles) from the epicenter. The buildings are undamaged and the staff unharmed, but patients from Nepal have begun arriving for medical care because the Nepal hospitals are overwhelmed and often without water or electricity. Dr. Christo Philip serves at Duncan Hospital and was working when the earthquake hit. He says, "There was chaos in the hospital as patients ran outside, and that included having to move a patient who was in the operating room out of the building where we completed the surgery. So far we think there have been about 6 deaths in our district and about 35 confirmed dead in Bihar. We had several patients brought in immediately after the earthquake to our emergency department including several fractures and a head injury. Unfortunately the devastation farther north of us in Katmandu is tremendous. Please pray for the families of those who have lost their lives and for how we can help. The first of the victims from Kathmandu have arrived at Duncan Hospital tonight. Two construction workers came with lower extremity fractures sustained when buildings collapsed on them. Their families report multiple people dying all around them and that very limited medical care is available, which is why they made the 200 km journey to reach Duncan. Please pray that many more patients who need help would find their way to Duncan in the next few days since many of the hospitals in Nepal are overflowing with patients and they are without electricity and water in many regions." Many have asked what can be done. First, please pray for EHA's team in Nepal. Pray for their safety as well as wisdom to compassionately demonstrate the love of Christ to those they encounter. Second, significant resources will be needed to finance the relief efforts EHA has initiated. Your response in this tangible way will be much appreciated. To give immediately to the designated Nepal Earthquake Fund, click here. Your gift will be processed immediately and the interface is completely secure. Thank you for your partnership. We will update our Facebook page and website regularly with additional information as it becomes available, and will distribute news via email as well as the situation warrants. As of April 1, EHA India has a new Executive Director -- Dr. Sunil Gokavi. We are excited to see what his leadership will bring to EHA. The following is his autobiography that gives us a glimpse into Dr. Sunil's background and testimony. My name is Sunil Gokavi, and I was born and bred in Bangalore before embarking on my medical studies at Christian Medical College, Vellore, in 1983. I met Joanna, my wife-to-be, at medical school (she was a classmate), and we were married soon after our internship. Our first exposure to missions was in Nadiad, Gujarat, in the Methodist hospital, and after a year we moved to EHA's Chhatarpur Christian Hospital, both as part of our service obligation for sponsorship to CMC Vellore. Our experiences, though varied, impressed upon us the necessity for doctors in the mission field, given the seemingly endless need. So it was natural for us, on completion of our post-graduation residency also at CMC - my wife as a biochemist and I as a general surgeon - to serve at a mission hospital, initially to once again fulfill a service obligation, and then to carry on in the same field. As a young family we were posted to EHA's Lakhnadon Christian Hospital in Madhya Pradesh -- a small hospital in a tribal belt. Since our first two children were small, and the town lacked an English school, my wife elected to homeschool them in the initial years while I often single-handedly managed the 30-bed unit, building up its surgical services as well as catering to every sort of patient who came to us in need. Due to lack of adequately trained personnel, I was by default the administrator, as well as the head of the community health project, which we developed and successfully ran in the nearby villages. Thus began our practical education in a life of faith and dependence on the Lord - most of the time it was tough going, but what we experienced of the Lord in terms of His provision and protection is too difficult to adequately describe in words. We faced personal issues, family difficulties, staff unrest, financial obstacles, and opposition from many quarters (including physical assault), besides the perennial shortage of doctors - but on looking back, we could say from the heart that "His Grace was sufficient for us." What I could achieve professionally was also fairly remarkable, given that I had no anesthetist, no proper modern equipment, nor any form of support, save the Presence of the Lord. Toward the latter part of our stay of nearly seven years there, my wife Joanna joined in the work by learning ultrasonography and medical ophthalmology, enabling her to start the latter department. Then we had the opportunity to go to Sydney, Australia, for a couple of years, where I worked as a surgical registrar, gaining experience in laproscopic surgery and endoscopy, which has since stood me in good stead on my return to the mission setting. Many people did not expect us to return, but even as we experienced the abundance of all the West had to offer, it strangely cemented the fact in both our hearts that mission hospitals in India were the place we ought to be - so it was no great effort to make the decision to return, our hearts full of gratefulness to the Lord for the wonderful break He had afforded us! We most recently worked in the largest of EHA hospitals - the 220-bed Duncan Hospital, situated in one of the most underdeveloped districts of India - East Champaran, in the neglected state of Bihar. Joanna has honed her sonographic skills to be able to single-handedly man the department, while she also contributes to the monitoring of the laboratory work. I am one of two surgeons, involved in the strategic development of the flagship hospital of EHA, as well as overseeing the community health work through the hospital. In recent times, I also took on the additional responsibility of being one of the Regional Directors for EHA, overseeing four hospitals. This also involves praying over and planning the direction the organization needs to take, along with others on the central office team, based in Delhi. A major part of that effort is directed at recruitment-- the challenging of Christian medical professionals to either directly or indirectly contribute to the furtherance of medical missions in our country. Most recently I have been asked to take on the mantle of Executive Director of EHA from Dr. Santosh Mathew - a role that I approach with 'fear and trembling,' yet in the quiet confidence and trust that emanates from our dependence on a sovereign God who knows the beginning from the end. At this point of political uncertainty as far as Christians in India go, I still do strongly believe that we in EHA have a tremendous opportunity to impact our nation for Christ, by initiating and implementing programs and services that stay focused on the poor and marginalized, who form a major proportion of our teeming population. The success achieved by steps taken in the recent years in interacting with the government and larger partners spur us to strive even more in this direction, as we are able to be the 'salt and light' where God has placed us. We see our work through EHA as a great opportunity for the Gospel in largely unreached areas, which is the primary purpose of our labor, even as we seek to develop the services offered through our hospitals and community programs. While it may seem a lot to 'give up,' we have in truth gained so much experiential knowledge of the Lord that we would never want to exchange this privilege He has given us for anything else in the world! The Emmanuel Hospital Association USA board of directors has appointed Robb Hansen as executive director of US operations. Dr. Howard Searle has been named president of EHA USA. Mr. Hansen has served EHA as an outside consultant for several years. His assumption of a formal role will allow him to shoulder some of the leadership responsibilities which Dr. Searle has carried alone. Mr. Hansen said, "Ever since I began supporting EHA's efforts to serve the poor of North India I have been impressed with the staff's diligence and compassion in the name of Christ. I am honored to take a larger role and pray that the exposure and support EHA receives from its US partners will continue to expand." As Mr. Hansen assumes greater responsibilities for fundraising efforts in the US, Dr. Searle will continue to represent the organization domestically and internationally, and will focus on developing professional partnerships which will enhance EHA's professional development efforts. Praise God for a successful conference, Engage Disability, at the end of September. Over 400 people participated from hospitals, Christian health organizations, churches, and non-governmental organizations. The emphasis was on turning the conference into a movement toward including the disabled in India. The conference opened with the leaders praying for the conference and then signing the conference banner with a handprint. Later, all the delegates added their handprints to the banner, making it a beautiful representation of all Christians giving a hand to work toward the declaration: to see those with disability accompanied, loved, and included in the body of Christ. The four sessions focused on looking up at God, looking into our church, looking around us at our families, and looking out to the world -- all with a focus on those with disabilities. They discussed topics such as "How can the church be more inclusive?" and "How does including the most marginalized people transform communities and make society a better place?" A petition was formed for the Indian government demanding that they fully enshrine the UN Convention on the Rights of People With Disabilities into Indian law. Two well-known disability advocates are arranging to present this to the Prime Minister of India, Mr. Narendra Modi. Thirteen regional sub-groups were also set up to create a platform for unity, prayer, and synergy in their areas. Pray for success as they move toward these goals. Dr. Mark Kniss, who contributed significantly in the early years of EHA, passed away on June 10, 2014. His legacy with EHA goes back to 1960, when he started a clinic in India that became Nav Jivan Hospital, which was a 60-bed facility by the time he left in 1973. Dr. Kniss was instrumental, along with others, in the development of EHA in India when several doctors requested a Christian organization to handle the management of their hospitals. Back in the US in 1996, he worked with several others to found EHA USA to support EHA in India. He sensed that an American presence could be very helpful for EHA. He served on the EHA USA board for many years. After his retirement in the US, he made five trips back to India to assist at Nav Jivan Hospital, and his 2011 trip was made to celebrate the 50th anniversary of the hospital. Dr. Kniss was a gracious, caring man and a committed follower of Jesus Christ. He was a quiet person, so people listened when he had something to say. He will be missed by EHA and by all who knew him. Well done, good and faithful servant of the Lord. The International Christian Medical and Dental Association (ICMDA) connects Christians in medicine and dentistry from all around the world. Uniting 69 national movements in fellowship, witness, and service, they apply biblical principles to their practices day in and day out. In addition, senior personnel reach out to Christian medical and dental students and graduates around the globe. Every four years the ICMDA hosts a World Congress. This summer more than 1,000 delegates gathered in Rotterdam, The Netherlands from July 22 to 26. Featuring the theme SERVE SHARE SHINE, sessions focused on the nature of our identities – both as Christians and as medical professionals, and explored how these can be integrated. A student pre-congress focused on helping young people catch the vision of Christian witness and service in the healthcare fields. The goal was to assist, encourage, and equip those who are called and appointed to share this vision with upcoming generations. These sessions began with teaching on our identity in Christ, answering the question, “What does it mean to serve and follow Christ in our daily lives, either as students or as we begin to work as medical and dental professionals?” The second day focused on spiritual competencies – how to develop our own and encourage others to do so – and how the spiritual aspects affect competency in other areas. The final day looked at how to face the challenges in medical and dental practices and still be a living testimony for the Lord. The main Congress was inaugurated with a gala dinner and an opening meeting on Tuesday evening. The keynote lecture on Wednesday was given by Gisela Schneider, a veteran female medical missionary who served many years in West Africa. She currently directs the German Institute for Medical Missions. Acknowledging the impact of current events on those gathered, Dr. Schneider facilitated a moment of silence in memory of the 193 Dutch citizens whose bodies were being returned from the Ukrainian crash site of the Malaysian airliner, shot down by rebel separatists just days before. The delegates united in prayer for the grieving families. Wednesday evening an International Food and Games night was held. Each national delegation served food and drinks from their country, giving attendees an opportunity to meet colleagues from around the world and learn about cultural differences and habits, as well as try a few unfamiliar games. Thursday’s keynote lecture, “Sharing in Practice,” was given by John Wyatt, a Professor of Ethics and Perinatology at University College in London. His current work focuses on the ethical issues raised by advances in reproductive and medical technology at the beginning of life. The final keynote on Friday focused on “Shining in Society at Large,” and was given by Issam Raad, the Chairman of the Infectious Diseases Department at MD Anderson Cancer Center in Houston, Texas. Prof. Raad is also the president of an organization that helps bring physical, psychological, and spiritual healing to hurting people in the Middle East. In addition, he pastors the Arabic Evangelical Church of Houston. Dr. Searle found opportunities to mentor young people at the Congress. “Becky and I were also impressed with the openness of the young doctors and medical students from a wide array of backgrounds. We had numerous enjoyable opportunities to interact, to share something of God's faithfulness in our lives, and then to encourage and reassure them that they are special to the Lord Jesus and are loved by Him.” Dr. Searle shared promises from God's Word which have been very helpful to him: Ps. 16:11, Ps. 32:8, and Prov. 3:5, 6. He also encouraged them with the idea that their availability to serve is more important than their ability to serve. “We covenanted with several to pray with them on an ongoing basis and to keep in touch,” he added. This year’s Congress witnessed EHA leaders in various roles. Dr. Vinod Shah, the Chair of EHA's Board in India, and a member of EHA USA’s board, is also the current CEO and the first 'non-western' leader of the ICMDA. Dr. Santhosh Mathew, EHA's Executive Director, and Dr. Anil Cherian led break-out sessions. Cherian is implementing ICMDA's initiative to train medical officers in the strife-torn nation of South Sudan. God is working through these men and women who have chosen to make themselves available to God. Dr. Howard Searle, a retired surgeon living in the Chicago area, helped found EHA in India more than 40 years ago and now serves as volunteer Executive Director of the organization's US operations. Read on for a Q&A to learn more of his story. How were you first moved as a young man to serve those in need without access to care? I sensed God's call on my life at the age of 13 when I heard the challenge of Christian missions in our church in a small town in Ontario, Canada. That call of God motivated me through high school, premed studies, medical school, my internship, my surgical residency, and my nine-month fellowship in anesthesia (I was curious to learn what happened on the other side of the curtain). During the latter I learned through longtime friends that my denomination (Fellowship Baptist) had established a link with the Conservative Baptist Foreign Mission Society in the US. As part of the British Commonwealth (which included India), they were being granted visas unlike those from the US. Within three months from the end of my anesthesia fellowship, we were in India as a family of 4 ¾, fully supported and with visas in hand. God was very good to us. As the only doctor, within two weeks I became the medical superintendent, but I knew so little of the culture and less of the local languages. Was there something about India that captured your interest and called you to serve there? No, I knew very little about India -- I guess I learned 'on the run.' I had been actively recruited by a mission organization with ministries in Zambia and Zimbabwe, but I sensed so many of the arrangements were just too ideal. While in the midst of exploring opportunities worldwide, we were advised of the medical ministry in Central India, and God clearly took care of the rest. After five years in that mission hospital, I was invited to become part of the formative team involved in what God brought forth into the Emmanuel Hospital Association. What struck you the most when you began serving in India? The friendliness, openness, and hospitality of the people, plus an awareness that God was at work, through His Church and His people in India, through whom He is continuing to do much. 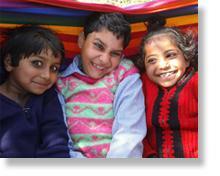 The Shalom Delhi Project provides care and support for people living with HIV/AIDS. They offer home-based and palliative care, work with transgenders and adolescents, and help those with TB. Learn more about the many aspects of their program. Support these relief efforts with a donation. Record flooding along the Ganges River has displaced thousands in villages in remote areas of the state of Bihar. Learn more about EHA's efforts to assist those affected. Support these relief efforts with a donation. He served for 23 years, beginning in 1973. The first Indian Executive Director of EHA, Mr. Lalchuangliana, was honored by Dr. Howard Searle, EHA-USA's Executive Director. Dr. Searle had the privilege in the early 70s of recruiting Mr. Lalchuangliana away from his secure senior government job to serve with EHA. Dr. Searle was very happy to pay tribute to him for all he had done in leading EHA with humility and integrity for over two decades. Attending the celebration commemorating the 15th anniversary of Shalom-Mizoram's ministry were EHA staff and other dignitaries, including the Chief Minister of the State of Mizoram. EHA thanks God for faithful servants who have given much of their lives working for our cause in serving the poor. Interested in medical missions? Want to learn more? Join us at INMED's "Exploring Medical Missions... The Road Less Traveled" Conference from May 31 to June 1 in Kansas City, MO. This event is for healthcare professionals and students, globally-minded people (including non-healthcare professionals), undergraduates, and high school students who want to progress from good intentions toward genuine service on behalf of those people most in need. Congratulations go out to three EHA doctors who won the 2012 Dignity and Right to Health Award from the International Christian Medical and Dental Association (ICMDA). This international award was established to address health and development issues including HIV/AIDS. Drs. 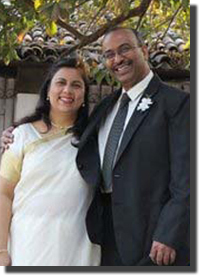 Isac and Vijila David of Prem Jyoti Community Hospital have served in the remote and neglected area of Jharkhand, India, ever since they graduated as Family Physicians fifteen years ago. They work with the Malto tribals, focusing on health education, endemic diseases, immunization, and reproductive and child health. Dr. Saira Paulose leads the SHALOM-Delhi HIV/AIDS unit of EHA. She has put together a team that significantly impacts many HIV-affected individuals and families. In addition to clinical care, the project’s home-based care ministers to those in poverty-stricken communities and others of migrant origin. Helping with the stigma and discrimination of the disease is an important aspect of their work. Villagers in Assam are accustomed to the Brahamputra River overflowing its banks each year during monsoon season. But in the last two weeks, more than 2,000 villages in 27 districts have been inundated in the worst flood in a decade. At least 124 people have died in the flooding and 16 more in resulting landslides. Around 2 million people have been affected, with many having lost their homes and livestock. Would you help EHA respond to this disaster? You can easily and safely make a donation online by clicking here. Read on to learn how EHA is responding in the name of Christ to this emergency. After twelve years of faithful service at EHA hospitals, Dr. Chering Tenzing has the opportunity to go to the UK for a year of fellowship in Acute Care Medicine. Dr. Howard Searle, a retired surgeon living in the Chicago area, is visiting EHA facilities across north India. Dr. Searle helped found EHA more than 40 years ago and serves as volunteer executive director of the organization's US operations. Medical and health care systems in countries like India provide key support in the days and weeks immediately following a disaster. Find out how EHA approaches these ministry opportunities.